The Passat, like many other VW’s since the ‘70s, is named for a wind. We’ll just have to see if this Nice Price or Crack Pipe TDI wagon has a price that… well, you know, blows. How much does one lap of luxury cost? Well, when we’re talking about doing it in yesterday’s 1984 Maserati Quattroporte III, about $10,500. That reasonably clean and tidy example couldn’t make that lap dance at such a price however, and the car fell in a 68 percent Crack Pipe loss. The Passat is one of my favorite Volkswagen models. Not because I particularly jones over the company’s middle manager saloon, but because of the model’s comical vacillation in engine direction over the course of its many iterations. It seems that every other Passat shares its platform with its Audi 80/A4 sister and that means longitudinal engine placement. Every other gets built on some sort of Golf-derived platform with a transverse mill. It’s like it’s been in rehab multiple times but still can’t kick the habit. Here we have a 2005 Passat TDI Estate, which represents from the final year of the B5.5 (facelift) model run, the last time (so far) the car came with underpants shared with an Audi. This model also represented the first time that Volkswagen put serious work towards moving the Passat upscale as part of of the company’s mostly failed attempt to shed its “People’s Car” image. In the case of the Passat that work included making available a wildly complicated W8 engine coupled with 4motion all-wheel drive, and some fancy wood for the interior. This one has none of those. Instead, it rocks a 135 horsepower/247 lb ft of torque 1,968 cc direct-injected turbo diesel under its hood. That’s coupled to a ZF-sourced five speed transaxle and the car puts its oily ponies through the front wheels exclusively. This wagon boasts being a one-owner car and while it would have never been confused for one of those high-zoot W8 cars, it still has a lot of accoutrements and accommodations to make your life a little more comfortable. The car comes with leather seating surfaces, which all look to be in fine shape. The otherwise plasticky but seemingly perfectly serviceable interior also offers such niceties as power and heat for those seats, a moonroof, and a stereo with booth a CD and cassette! The seller claims the car to feature “low miles” but the total on the clock is 167,000 so I’d be interested to see just where his cutoff resides. The car looks to be in pretty nice shape for those miles, with the aforementioned decent interior and an exterior in Platinum Grey Metallic that seems free from warts and boogers. In fact, the only obvious need here is a clean up of the headlamps which are as cloudy as the memory of a one-night stand. New Pirelli tires on tidy factory alloys counter that. Here’s the deal on this Passat TDI—it’s one of the last wagon editions VW offered in the States (thanks for nothing, SUV buyers) and it’s one of the diesel models that, guess what, you’re also not going to be able to buy here anymore. That diesel is also a mill that Ward’s Automotive once considered one of the best engines in the world. There’s a lot of appeal here, if you’re into such things. Which you probably should be. 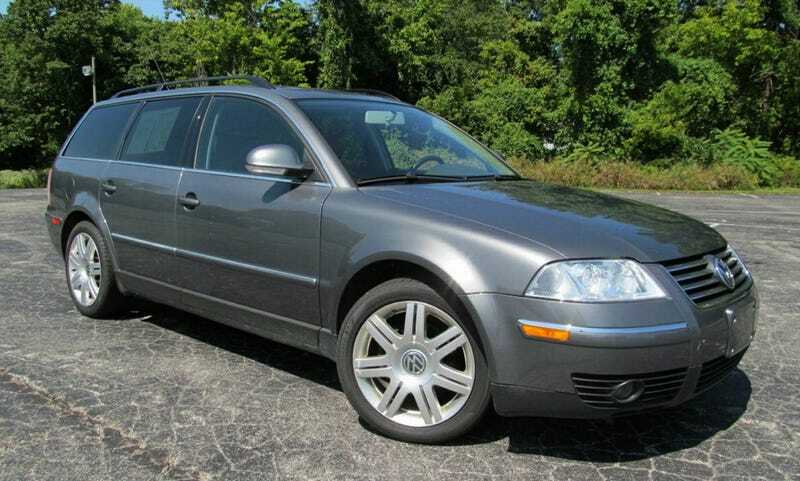 Okay, so what exactly would you pay for a 167K TDI Passat wagon in pretty nice shape? This one’s asking $5,999 which is down from the $6,400 its seller originally wanted. Is that enough of a drop? Or, is that just a drop in the bucket? How About This Seemingly Clean 1980 VW Dasher Diesel Wagon For $3,250?